One of the first men to fly an aeroplane over Hatfield went on to carve his name in history. His wife and son also took to the skies. All three made a contribution to history but while their story is a remarkable one, sadly, there is no happy ending. Mr Moorhouse of Portholme Aerodrome appears to have been the first man to fly over Hatfield in 1911 on his way back from Brooklands. 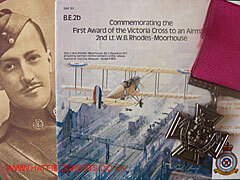 William Barnard Rhodes Moorhouse was born on 26 September 1887. His father, Edward Moorhouse, was described as a 'Gentleman of Independent Means'. His mother was Mary Ann Moorhouse, formerly Rhodes. 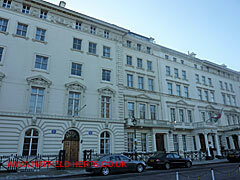 The house were he was born –15 Princes Gate (entrance behind the black car) – overlooks Hyde Park. Somewhat surprisingly, there is no commemorative blue plaque (while there are two on the adjoining property). This may be a result of his later name change. The family either had a country house or moved out of London as a 1911 report in Flight refers to him visiting his parents' home at Spratton Grange, 'a few miles northward of Northampton'. 14 Princes Gate (the property with the plaques) was once home to US ambassadors including Joseph Kennedy, father of President John F Kennedy. Later it was the headquarters of the Royal College of General Practitioners, who bought No.15. What was 15 Princes Gate was briefly home to the SAS in 1980 before they dramatically stormed 16 Princes Gate (with the flag) –which was and remains the Iranian Embassy. William was named after his maternal grandfather William Barnard Rhodes. Grandfather Rhodes was one of four brothers (from a family of fourteen raised in England) who played a pioneering role in British New Zealand. William Barnard Rhodes had already achieved a measure of success as a sea captain and part owner of a ship before settling in New Zealand. Rising to become a successful politician, he is also credited with founding the New Zealand Shipping Company, New Zealand Insurance Company and the Bank of New Zealand. However, he remained childless until a Maori chief arranged for a local woman to be a surrogate mother. After his death in 1878 his only child, Mary Ann, received a sizeable portion of his huge estate. Her son (our pilot) only changed his surname to Rhodes-Moorhouse in the 1910s. By which time he had already achieved a level of fame as the pilot W B R Moorhouse (the late change of a middle name to part surname – he only appears to be referred to in the press by the hyphenated surname around 1913 – resulted in some confusion, and some articles give his name as William Barnard Rhodes Rhodes-Moorhouse). Educated at the Golden Parsonage, Hertfordshire; Harrow (although one source states he was at Harrow first; another makes no mention of his schooling before Harrow) and Trinity College, Cambridge. He is said to have had a love for speed and there is an unconfirmed report that he was involved in a fatal motorbike accident involving a child in 1906 (in 1907 in New Zealand, according to another). After college he took part in monoplane experiments at Huntingdon between 1909-10 (Rhodes-Moorhouse's pilot's licence, dated 17 October 1911, lists his profession as an engineer). Joining forces with James Radley, they developed the Radley-Moorhouse monoplane, which may have been the machine he was using when he flew over Hatfield (although he is also known to have flown some Bleriot designs). In September 1910, Radley and Moorhouse sailed to the States (1911 according to at least one source), where they made a number of demonstration flights (using a Bleriot) and took part in air races before returning in February 1911. According to one source, Moorhouse was the first man to fly through the Golden Gate Gorge (the landmark Golden Gate Bridge was only built in the Thirties). While William's wartime heroics ensured his adopted name of Rhodes-Moorhouse will not be forgotten. James Radley did more to develop aviation as a pilot and designer. However, some books on early British aviation don't even mention him. His father was reportedly a colliery owner – certainly he appears to be from a wealthy background. His pilot's licence (No.12) shows that he passed his test on 14 June 1910 flying a Bleriot monoplane at Brooklands. However, he was giving display flights before then – on 2 June 1910 he took part in the first aviation meeting in Scotland (at Pollokshaws, Glasgow). During his trip to the States with William, James Radley came first at an aviation meet in San Francisco in January 1911. Back in Britain, he took part in many races and events. In July alone he entered the Gordon-Bennett Aviation Cup Race at Eastchurch, the Daily Mail circuit of Great Britain (S F Cody was another of the pilots) and won a prize for a 132 mile journey in a cross country balloon race. He is also known to have taken part in motor racing. Apart from the Radley-Moorhouse monoplane, as a designer, James Radley also built a seaplane in partnership with Eric Cecil Gordon England in 1913. He served as the chairman of Portholme Aerodrome Limited, which was voluntarily liquidated following a resolution in February 1918, with the assets going to Portholme Aircraft Company Limited (established in 1911). The site was again on the market in 1920. This appears to mark the end of his involvement in aviation. His death in 1959 appears to have gone unnoticed. Hardly a fitting end for one of the true pioneers of British aviation. On 14 May 1912 William's engagement to Linda Beatrice Morritt, youngest daughter of the late Robert Ambrose Morritt and reputedly a close friend of his sister Anne, was announced (with the wedding taking place on 25 June). Note (06.03.12): William had also made a name for himself as a racing driver at Brooklands. In 1908 he drove a Fiat called 'Linda' (which suggests a romantic interest going back several years). While a history of Brooklands describes his racing colours in 1909 as a light mauve coat and sleeves with dark purple collar, cuffs and caps, which suggests early racing drivers styled themselves along the lines of horse jockeys (something not apparent in the black and white photographs of the day). He also entered aerial derbys at Brooklands and flew alongside aviation pioneers like T O M Sopwith and Claude Grahame-White. There are conflicting versions regarding the details but – after reportedly having gone to Belgium to take delivery of a Breguet biplane, which he intended to enter in the Military Aircraft Trials at Larkhill, Salisbury Plain (or a planned attempt at a cross-Channel flight, according a different account) – he is credited with being the first person to fly two passengers across the English Channel in an aeroplane on 4 August 1912. One was his wife Linda, the other passenger is believed to be John Henry Ledeboer, a well known name in the Royal Aero Club. The flight ended in a crash landing near Ashford, which destroyed the aircraft but without harming anyone (although one account suggests Linda suffered a miscarriage). Note (06.03.12): there is also a report of another crash earlier that year (on 7 April 1912) at Huntingdon. Evidently, his plane suddenly lost height and crashed. William sustained "a nasty gash on the lower part of his face". While the plane was extensively damaged, if the ground hadn't been soft it is likely that the results would have been far more serious. A report in The Times on 6 August 1912 lists Moorhouse as one of the pilots taking part in the Larkhill trials the next day. The Military Aircraft Trials were a major event and one of the main talking points was an unscheduled flight by Geoffrey de Havilland on 12 August. Flying a BE2 (Bleriot Experimental 2 – later called a British Experimental, which was largely his own design), with Major Frederick H Sykes as passenger, he established a new British altitude record of 10,560ft. Sadly, the trials were marred by the death of pilot and designer Robert Cooke Fenwick, who was killed the following day in his Mersey monoplane. There is an unconfirmed report that following his own accident William concentrated on motor racing at Brooklands. Although, he is known to have taken part in the Third Aerial Derby from Hendon in May 1914 (and had finished third in the first Derby in June 1912). Linda gave birth to their only child, William Henry Rhodes-Moorhouse, on 4 March 1914. According to at least one account, father William Barnard Rhodes-Moorhouse was present at the time and assisted with the delivery. William Barnard Rhodes-Moorhouse joined the Royal Flying Corps on 24 August 1914, and shortly after was placed in charge of the workshops at Farnborough. However, a shortage of pilots meant he was sent out in March 1915 to join No.2 Squadron, No.1 Wing at Merville (a different version is that it was the result of his pressing for a combat posting). During the Second Battle of Ypres an urgent call came from Headquarters for the railway junction at Courtai to be bombed to prevent the Germans from bringing up reinforcements. William Barnard Rhodes-Moorhouse was under no illusion about the hazards or the importance of the mission. He wrote a letter for his son and after 'quite an argument' with his observer (who wanted to go with him) took off alone, in a BE.2b carrying a single 100lb bomb, at 15:05 hours on Monday, 26 April 1915. He carried out his attack at low level (some accounts say 300ft, others that it was low enough for German gunners in a belltower to fire across at him). He was hit in the thigh, abdomen and hand (again, conflicting reports as to the sequence of his injuries and when they occurred) but pressed home his attack. The raid was later described as the single most important bomb dropped during the war. After piloting his aircraft some 35 miles from the point of his first major injury he landed back at Merville at 16:15. His observer, who was one of the people who helped him from his aircraft and were amazed that he had made it back given the extent of his injuries, noticed a line of bullet holes across the cockpit in which he would have sat (in total, the aircraft is said to have had 95 holes from bullets and shrapnel). There are claims that if he had received immediate medical attention he would have survived. However, Rhodes-Moorhouse refused treatment until he had made his report by which time it was too late. He died from his wounds the following day at 14:00, aged 27, but not before he had been read a message from the Field Marshal Commander-in-Chief expressing his admiration for his courage. A short time after his death, it was announced that he had been awarded Britain's highest gallantry honour – the Victoria Cross. The award also marked a milestone in the history of the honour as it was the first VC awarded to an airman. Details of his exploits were reportedly translated into Hindi and read out to Indian troops in the trenches at the front who had seen him flying overhead. William Barnard Rhodes-Moorhouse made a last request that his body be returned to England for burial, which was granted (an unusual occurrence). He was buried at Parnham House, Dorset (some accounts say it was a property bought by him, others by his parents, and another states it was by his parents at his urging). The property dated back to the days of Henry VIII, and Charles I reportedly stayed there during the Civil War. It was sold by Linda Rhodes-Moorhouse in 1928. The house was later used as a base for the Parnham Country Club. Miss Sicele O'Brien organised a small flying display for it in May 1930 (sadly, Miss O'Brien and a lady friend were killed in a take off accident at Hatfield the next year). Equally tragic, the grounds of the property later provided the final resting place for another Rhodes-Moorhouse.